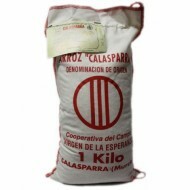 Buy Calasparra Rice 35oz. The Denomination of Origin rice round grain Calasparra with an average length of 5.3 mm; during cooking of this variety of rice grain reaches a 70% of its size, is very resistant grout. Broth absorption in the paella is 3.5 parts per each of rice and the cooking time is around twenty minutes. Gourmet Spanish Product.